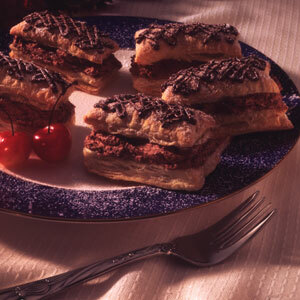 These non-traditional Napoleons are filled with cinnamon-flavored chocolate mousse and drizzled with melted chocolate. Give them a try...they're exquisite. Unfold the pastry sheet on a lightly floured surface. Cut the pastry into 3 strips along the fold marks. Cut each strip into 6 rectangles. Place the pastries 2-inches apart on 2 baking sheets. Bake the pastries for 15 minutes or until they're golden brown. Remove the pastries from the baking sheets and cool on a wire rack for 10 minutes. Put the cream and cinnamon in a medium bowl. Beat with an electric mixer set on high speed until stiff peaks form. Fold in the melted chocolate pieces. Split each pastry into 2 layers, making 36 pieces. Spread 18 bottom halves with the chocolate cream mixture. Top with the remaining top halves. Serve immediately or cover and refrigerate up to 4 hours. Drizzle the pastries with the chocolate and sprinkle with confectioners' sugar just before serving. Easy Substitution: You can substitute 2 cups thawed frozen non-dairy or dairy whipped topping for the heavy cream.